The leadership of the Congressional Fire Services Caucus has selected Congressman Mike Bost (IL-12) to serve as a co-chair. Congressman Bost assumes the position following the retirement of former-Congressman David Reichert at the end of the 115th Congress. Currently serving his third term in the House, Congressman Bost previously served for two decades in the Illinois House of Representatives. The Congressman also served as a firefighter for the Murphysboro (IL) Fire Department. He graduated from the University of Illinois’ Certified Firefighter II Academy in 1993 and continued to serve the Murphysboro Fire Department during his six terms as state representative. The Congressman also served in the United States Marine Corps from 1979 to 1982. The Congressional Fire Services Caucus leadership is composed of eight members – four each from the Senate and House. Maintaining the bipartisan spirit of the Caucus, leadership is split evenly between party lines with four Democrats and four Republicans. The other co-chairs include Congressman Steny Hoyer (MD-5), Congressman Peter King (NY-3), Congressman Bill Pascrell, Jr. (NJ-9), Senator Tom Carper (DE), Senator Susan Collins (ME), Senator Jon Tester (MT), Senator Lisa Murkowski (AK). The Fire Caucus is among the largest caucuses in Congress. Members join to learn more about our nation’s fire and emergency services and the federal government’s role in addressing the needs of our nation’s fire and emergency services. A list of current members is located on CFSI’s website. If your member is not on the list, please have them contact CFSI and learn the value in becoming a member. 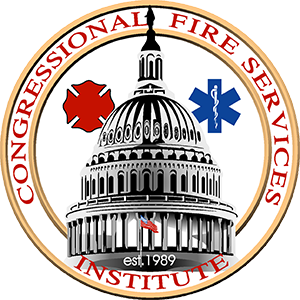 The Congressional Fire Services Institute is pleased to announce that Senator Tom Carper of Delaware will serve as the chair of the Congressional Fire Services Caucus for the 116th Congress. First elected to the Senate in 2001 after having previously served five terms in the House of Representatives and two terms as Governor, Senator Carper has been a tireless advocate for the nation’s fire and emergency services. Throughout his career in public service, he has advanced many initiatives to address the needs of the fire service. Formed in 1987, the Congressional Fire Services Caucus was established to educate members of Congress about the fire and emergency services. The Fire Caucus was created to be a bipartisan group where Republicans and Democrats could work together to improve the readiness of local first responders and to jointly recognize their valor and dedication. Today, the Fire Caucus is among the largest and most respected caucuses in Congress. A current list of Fire Caucus members can be found on CFSI’s website. The leadership of the Congressional Fire Services Caucus has selected Senator Lisa Murkowski (AK) to serve as a co-chair. Senator Murkowski assumes the position following the recent passing of Senator John McCain (AZ), a founding co-chair of the Fire Caucus. Since joining the Senate in 2002, Senator Murkowski has been a tireless advocate for the nation’s fire and emergency services. Throughout her career, she has supported the Assistance to Firefighters (AFG) and Staffing for Adequate Fire and Emergency Response (SAFER) grant programs. She fought for the reauthorization of the James Zadroga 9/11 Health and Compensation Act, and was the lead co-sponsor of the Firefighter Cancer Registry Act. The Congressional Fire Services Caucus leadership is composed of eight members – four each from the Senate and House. Maintaining the bipartisan spirit of the Caucus, leadership is split evenly between party lines with four Democrats and four Republicans. The other co-chairs include Senator Susan Collins (ME), Senator Tom Carper (DE), Senator Jon Tester (MT), Congressman Peter King (NY-3), Congressman Steny Hoyer (MD-5), Congressman David Reichert (WA-8), and Congressman Bill Pascrell, Jr. (NJ-9). The Fire Caucus is among the largest caucuses in Congress with nearly 240 members. Members join to learn more about our nation’s fire and emergency services and the federal government’s role in addressing the needs of our nation’s fire and emergency services. A list of current members is located on CFSI’s website. If your member is not on the list, please have them contact CFSI and learn the value in becoming a member. (October 5, 2018) – On Thursday, October 4th, the leadership of the Congressional Fire Services Caucus presented 103 American flags to the National Fallen Firefighters Foundation. The flags, which had been flown over the United States Capitol Building at the request of the Fire Caucus, will be presented to the survivors of the firefighters being honored at the 37th Annual National Fallen Firefighters Memorial Service on Sunday, October 7th in Emmitsburg, Maryland. Senator Jon Tester (MT), a co-chair of the Fire Caucus, presided over the official transfer of the flags to Chief Dennis Compton, the chair of National Fallen Firefighters Foundation (NFFF) Board of Directors. Senator Tester was joined by the Senate Chaplain, Admiral Barry Black, as well as senior staff from the office of Senator Susan Collins (ME), the current chair of the Fire Caucus. Bill Webb, Executive Director of the Congressional Fire Services Institute and Vice-Chair of the NFFF Board, served as the Master of Ceremonies. 103 firefighters will be honored at the Memorial Service, 80 who died in the line-of-duty in 2017, and 23 from previous years. 17 of the firefighters being honored died as a result of 9/11-related illness. Details about the 37th Annual National Fallen Firefighters Memorial Service, including how to view, can be found on the NFFF website. (October 5, 2018) – On September 28th, the Senate unanimously approved S. Res. 663, a resolution declaring September 2018 as “Campus Fire Safety Month.” The resolution was sponsored by Senator Susan Collins (ME), the chair of the Congressional Fire Services Caucus. Res. 662 encourages institutions of higher education to provide educational programs about fire safety to all college students, evaluate the level of fire safety being provided in both on-campus and off-campus student housing, and ensure fire-safe living environments through education, installation of fire suppression and detection systems, and the enforcement of fire and building codes. (June 22, 2018) – Earlier today, the House unanimously approved H.R. 931, the Firefighter Cancer Registry Act. The bipartisan legislation creates a specialized national registry to provide researchers and epidemiologists with the tools and resources needed to improve research collection activities related to the monitoring of cancer incidence among firefighters. The House had previously passed the bill by voice vote on September 12, 2017. However, on May 10th, the Senate amended the bill before approving it by unanimous consent. H.R. 931 was introduced by Congressman Chris Collins (NY-27) and Congressman Bill Pascrell, Jr. (NJ-9). Similar legislation, S. 382, was introduced in the Senate by Senator Robert Menendez (NJ) and Senator Lisa Murkowski (AK). The bill will now be sent to the White House for President Trump’s signature. (May 11, 2018) – On Thursday, May 10th, the Senate approved by unanimous consent H.R. 931, the Firefighter Cancer Registry Act. The bill, which was amended by the Senate prior to passage, was unanimously approved by the House on September 12, 2017. The bipartisan legislation creates a specialized national registry to provide researchers and epidemiologists with the tools and resources needed to improve research collection activities related to the monitoring of cancer incidence among firefighters. The amended bill will now go back to the House for final passage. (December 21, 2017) – On December 21st, the Senate approved by unanimous consent H.R. 4661, the United States Fire Administration, AFG, and SAFER Program Reauthorization Act. The House approved H.R. 4661 by unanimous voice vote on Monday, December 18th. The bill reauthorizes the Assistance to Firefighters (AFG), Staffing for Adequate Fire and Emergency Response (SAFER), and the Fire Prevention and Safety (FP&S) grant programs, as well as the U.S. Fire Administration through September 30, 2023. It contains many of the key recommendations the fire organizations presented to Congress earlier in the year that were incorporated into S.829, the Senate bill to reauthorize the two grant programs that was sponsored by Senators John McCain (AZ) and Jon Tester (MT). The bill also contains a “sunset” provision that would eliminate the grant programs, but the sunset would not take effect until September 30, 2024 unless Congress renews the programs before the deadline date. “For more than a year, the national fire services organizations have worked together to preserve the Assistance to Firefighters, Staffing for Adequate Fire and Emergency Response, and the Fire Prevention and Safety grant programs. The collective efforts of so many individuals and fire organizations made this outcome possible. CFSI takes great pride in playing an integral role in this process,” said Bill Webb, Executive Director of the Congressional Fire Services Institute. H.R. 4661 will now be sent to the President to be signed into law. (December 21, 2017) – The Congressional Fire Services Institute (CFSI) has named Senator John McCain (AZ) the 2017 Legislator of the Year. An original co-chair of the Congressional Fire Services Caucus, Senator McCain has been a long-time advocate for the national fire and emergency services on Capitol Hill.